in which chickens are swung and slaughtered during the week before Yom Kippur. Taking on religion (so-called) is never easy where animal victims are concerned, even when, as in the case of Kaporos, the law is on our side, as discussed by Daniel J. Solomon in Animal Rights Group Presses Fight Against Kapparot as Yom Kippur Approaches, published in the Forward on October 10th, and by Marcy Oster in California Judge Blocks Pre-Yom Kippur Kapparot Rite Over Cruelty Concerns, published in the Forward on October 10th. We are pleased to announce that, thanks to your generous support, we are nearing our target goal of $30,000 to support our lawsuit against the City of New York which is now in the Appeals court. At this writing we’ve raised $23,552 and need only $1,448 to reach our matching donation of $5,000 which will bring us to $30,000! Don’t be shy! DONATE! Help us help the birds in our legal battle on their behalf! 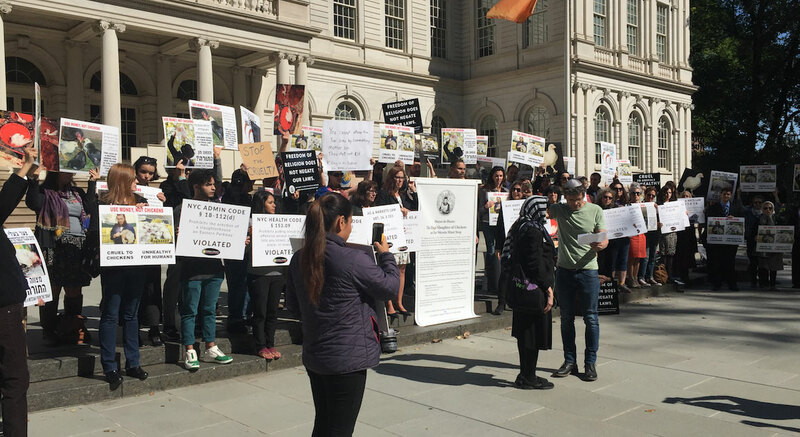 on October 5th to demand that Mayor de Blasio enforce the law. 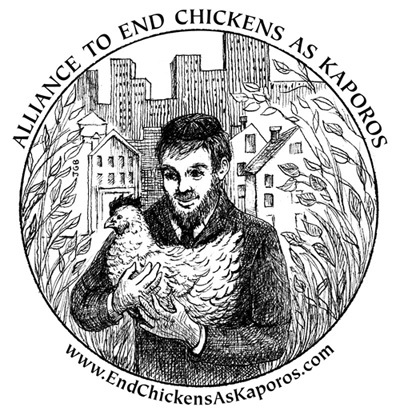 The Alliance to End Chickens as Kaporos is a project of United Poultry Concerns. Formed in New York City in June 2010, the Alliance is an association of groups and individuals who seek to replace the use of chickens in Kaporos ceremonies with money or other non-animal symbols of atonement. The Alliance does not oppose Kaporos per se, only the cruel and unnecessary use of chickens in the ceremony.